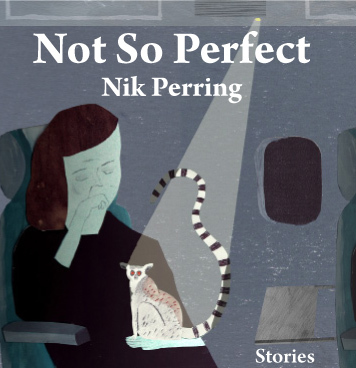 Not So Perfect is a collection of 22 short stories. They're very short - the shortest stories don't cover a page and the longest is maybe four or five sides long (and the book's only about the size of a CD case, so the pages aren't all that big). Most of them therefore fit very comfortably into the 'flash' bracket. Nik's writing style is very clear and concise, perhaps even minimalist. He distils the events he describes to the bare essentials; there's no lingering, no flowery prose. If you're used to reading classics, or just more "traditional" writing, it can feel a little sparse at times, although there's a real warmth to it, too. In several of the stories, the characters aren't named, and only a few of them take place in a definite location. Flash fiction does put significant demands on the reader; there are a lot of blanks to fill in. Nearly all the stories deal with relationships - whether they're just starting, stalling, or coming to an end. Some of the stories have strongly surreal or at least slightly skewed elements. There's a lot of sweetness, too - although sometimes it's concealed under a darker veneer. I really enjoyed this collection, and having read it again, I found plenty of new aspects I'd missed the first time around. In a lot of flash fiction, I sometimes reach the end of a story and wonder if perhaps the author brought things to a close a little too soon, or left a bit too much out for me to be really sure I'd 'got' the point he or she was making. But perhaps that's just the way my brain works - I don't like feeling I've missed something. Part of the appeal of Nik's work though is not so much that he tells you anything in particular, but that he just offers a new way of looking at something, a different take on a familiar situation, and leaves you to make your own decisions. I can't honestly say I liked every single one of the stories - a couple of them feel too slight, too much like a good idea with nowhere particular to go (besides, I can only think of a couple of collections where I've genuinely loved all the stories) - but overall I thought they were very good. I admire Nik's writing style, and it's interesting to see how he describes things so well with such a limited word count. My particular favourites are "The Seconds are Ticking By" (a story about a schoolboy who finds himself holding a grenade in one hand and the pin in the other), "Say My Name" (in which a lonely man fears he is fading away), and "The Mechanical Woman" (who believes she is unlovable, until a chance encounter with an engineer on a train). Whether you enjoy this book will depend, mostly, on how you feel about flash fiction. If you love to spend time with a character and really get under their skin, you may find the brief glimpses offered by Not So Perfect a little frustrating. If, on the other hand, you're happy to be dropped in just in time to share a tiny but vital moment in the history of a relationship, and don't mind being left to imagine how things turn out afterwards, you'll probably get a lot out of this book. Interested? Check out some of Nik's stories online and see what you think. I'm judging the Erewash Writers' Group Flash Fiction Competition. Up to 500 words themed around "Start" - it could be the start of something, a couple trying to start over, a car that won't start, you name it. It's free to enter, you can win a copy of Somewhere to Start From, and the winning story will be published on the EWG website (global exposure for your work!). The closing date is 21 March 2013, so get going! I listed a few tips on how to make your story stand out, HERE. Good luck! I prefer a longer read, but good flash fiction can create such a strong impression it stays with the reader and, in retrospect, seems like a much longer piece. Thanks for reading, Patsy. That was something that struck me as I read this collection again - quite often I was surprised how short the stories I remembered well actually were. They may be little, but they pack a punch! Thanks, Dan. Really appreciate it. And, of course, thrilled you liked it still! My pleasure, Nik. I hope all's going well with whatever you're lining up for us next. That's probably the best way to read this type of very short story - I think they can end up a little diluted if you read too many in one go. A bit of space either side helps each one sink in.